A friend of mine makes these; I had some this weekend and they are SO GOOD. 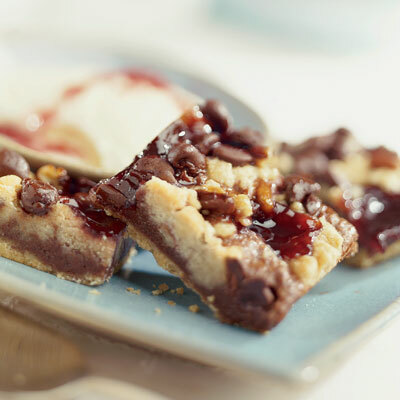 Shortbread-y crust topped with soft fudgelike goodness, topped with MORE shortbread, topped with raspberry jam & chocolate chips. Adapted from the “Chocolatey Raspberry Crumb Bars” in a joint Land O Lakes / Nestlé-sponsored recipe; click the link for the photo source and original recipe. Preheat oven to 350° F and grease a 13 x 9-inch baking pan. Cream butter, then cream together with sugar, flour, then salt. Lightly flour fingers and press 1 3/4 c (not all!) of the shortbread crumb mixture into pan, reserving the rest of the crumb mix. Bake 10–12 min (edges will be golden brown). In a small, heavy-duty saucepan over low heat, combine 1 c (not all!) chocolate and sweetened condensed milk, stirring until smooth. Pour evenly onto hot baked crust. Combine remaining shortbread-crumb mix and nuts (if using). Sprinkle evenly over chocolate-fudgy layer. Top with teaspoonsful of raspberry jam, then remaining chips. Bake for another 25–30 min. Cool before slicing.